Scott C Waring, a popular UFO researcher who runs the website 'UFO Sightings Daily' has claimed to have discovered a human-shaped structure on the surface of Mars. In his website post, Scott C Waring also shared a NASA link which featured the weird formation. Scott argued that the structure found on the Martian surface could be either an alien fossil or a statue. He also urged NASA to take a close look at the structure and unveil the hidden mystery. "The person seems similar to the Asian Buddha statue but may be a fossil. It appears to be laying back, looking up at the sky, as if it were waiting with the bravery of the impending doom about to hit the planet, which caused this devastation. Fossil or statue, it cannot be confirmed either way until the rover takes a closer look at it, and we all know NASA has a closed mind when it comes to investigating such discoveries," wrote Waring on his website. Waring also blamed NASA for their prejudiced mindset against the existence of alien life on Mars. 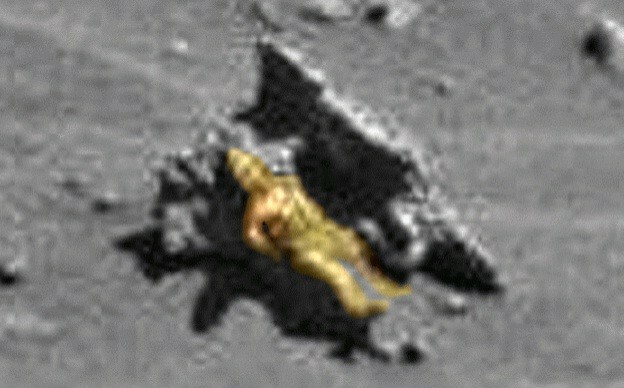 "I am a bit surprised that NASA overlooks so many alien artifacts in this one photo. You would think that an organization like NASA would stop the rover and investigate further into these anomalies on the surface of Mars, but instead, they just dismiss it all outright. It's like NASA landed the rover on Mars and already decided there is absolutely no chance life ever existed on this planet in its 4 billion plus years of existence," added Waring. This is not the first time that Scott C Waring is discovering apparent alien artifacts from the Martian surface. A few days back, Waring spotted three seemingly alien fossils from Martian images. However, sceptics continuously dismiss the discoveries of Waring stating that pareidolia is the cause of these visual hallucinations. Pareidolia is the capability of the human brain to figure out familiar objects on unknown structures.